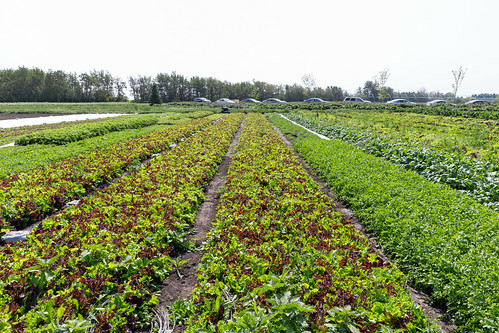 Those who frequent the outdoor City Market on 104 Street are likely familiar with Sundog Organic Farm. Operated by Jenny Berkenbosch and James Vriend, their booth is arguably the most visually appealing at the market. Their variety of fresh produce is always artfully arranged in wooden crates, beautifully displaying what the season has to offer. 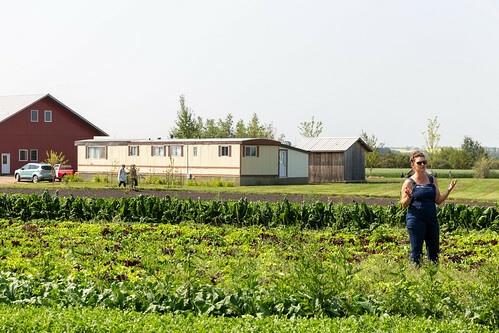 Mack and I have been buying from Sundog Organic for years (one of my favourite photos from our wedding day was taken in front of their booth), and have always wanted to be able to check out the farm itself. At the end of July, an open house provided the perfect opportunity to do so. Although Jenny and James originally started farming on his father’s land about ten years ago, they’ve been on their current property for eight years. Located just outside of Edmonton in Sturgeon County, near Gibbons, it was a lot closer to the city than I expected – it was about a 45 minute drive from 104 Street. We arrived a little late, but joined a group of about two dozen people who were already being led around the farm by Jenny and James. Their farm spans 14 acres, with about 6 of it being farmed at the moment. 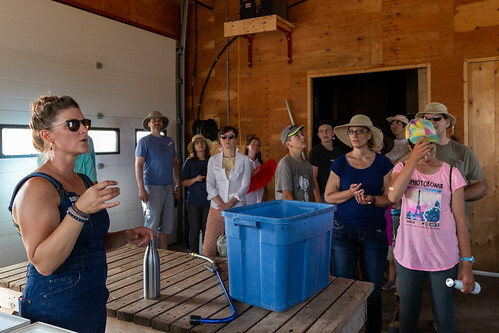 We learned that Sundog uses green manure practices to amend the areas they are rotating between seasons, meaning they plant crops like clover or oats to help renew and manage the health of the soil. Their property also happens to be near the Sturgeon River, which they are able to tap into for irrigation purposes. We also saw evidence of how the farm has grown over time – they used to store vegetables using a combination of a very small shed in addition to borrowing the storage capacity at James’ parents farm, but now, have been able to construct a building that is finally big enough for their current needs. It was great to be able to see their crops first hand. 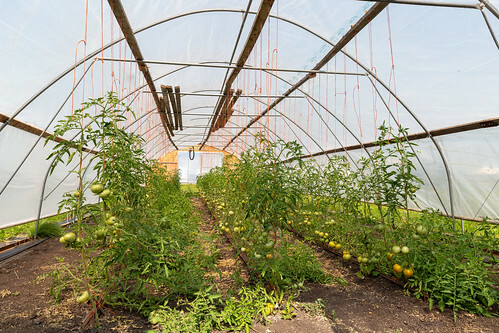 For me, it was especially neat to see where they grow their heirloom tomatoes, which I anxiously await the arrival of every summer. I’m also a sucker for berry patches of any kind, and strawberries are a particular treat! There’s really nothing like being able to eat sun-warmed fruit straight off the vine. 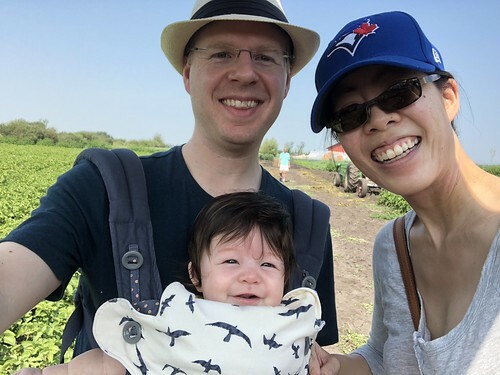 Of course, it was also nice to bring Emily along for her first farm visit! 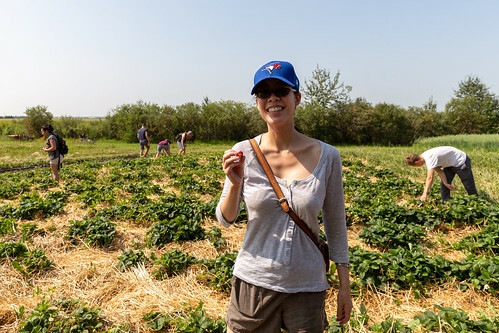 It will be one thing for her to see our very small community garden plot, but another to appreciate all of the work that goes into a farming operation. We look forward to bringing her along to more farms when she’s older, too. Thanks to Jenny and James for opening up your gates! 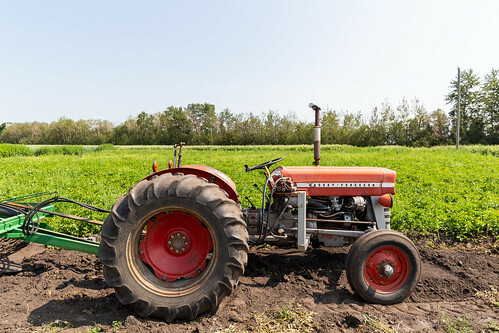 If you’re interested in visiting a local farm, make sure to check out Alberta Open Farm Days, which runs August 18-19, 2018 this year.